Situations can arise when you may have to take a place on rent. At the same time, you may also have a property to lease out to others as well. Under such circumstances, the property owners and the prospective tenants have to sign an agreement of lease. It should set out the terms and conditions of the lease, as well as the rights and obligations of both the parties. We shall examine such Lease Templates along with the Internal Link Anchor Text. 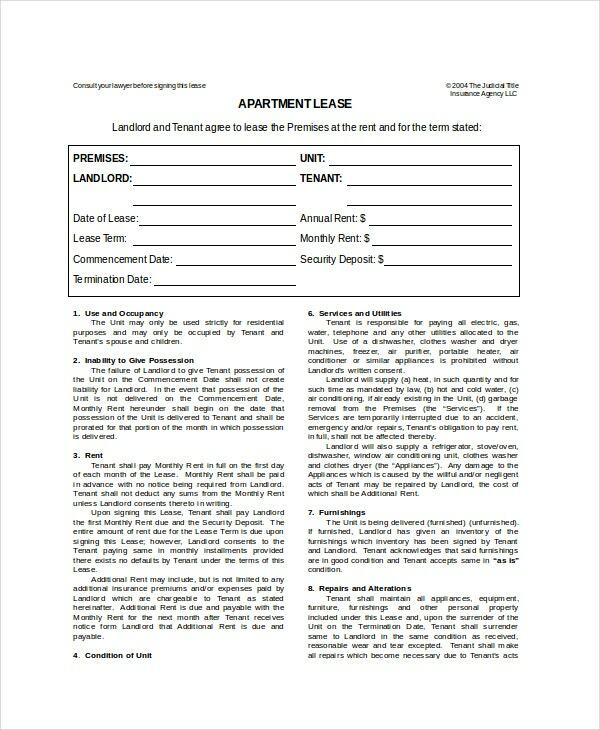 This is an Apartment Lease Agreement template useful when one takes an apartment on lease for residential purposes alone. The property owner, as well as the tenant, would have to sign the lease agreement. Filling up the template would be easy as it does not require much detail. 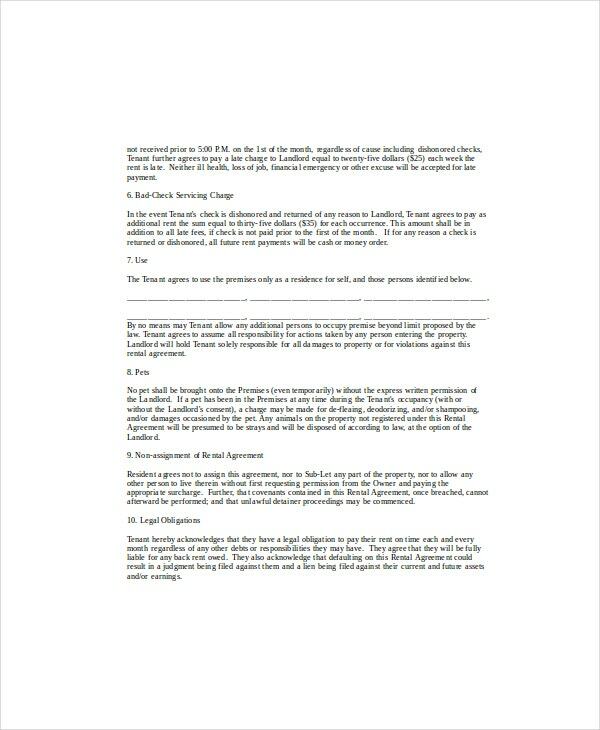 This is an Apartment Lease Contract Template executed by the property owners as well as the tenants. They have to execute this contract when taking an apartment on lease for a period not more than one year. It could also be a sort of a mobile home or a condominium. The document in question is an Apartment Lease Application template. The persons desirous of taking an apartment on a rental basis have to apply to the property owners in this format. The format includes the personal details of all the applicants. 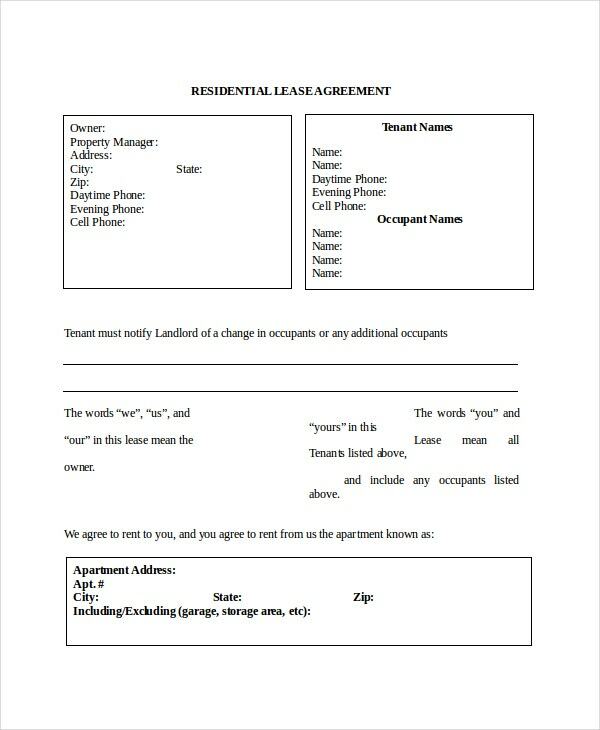 This is a Residential Lease Agreement Template. The executors of the document are the property owners and the tenants. They have to execute this contract when they take any apartment on lease for residential purposes. It lists out the terms and conditions to follow along with the rights of the tenants as well as the property owners. 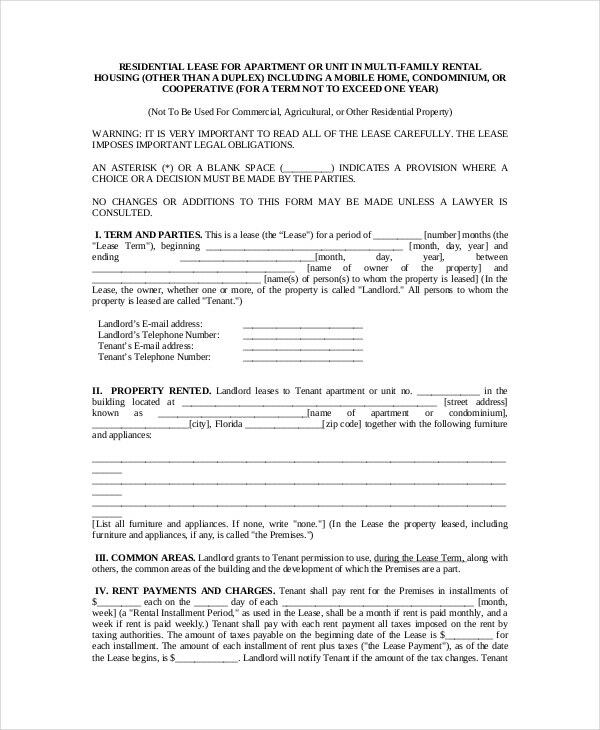 The property owners, as well as the tenants, will have to execute this Lease cancellation and termination agreement when they vacate the house taken on a lease. It sets out the details of payments to be made by either of the parties on the termination of the lease. This is a simple rental agreement that the property owners and the tenants would have to enter into when they take an apartment on a rental basis. The documents include the terms and conditions one has to follow. The payment terms should find a clear mention as well. 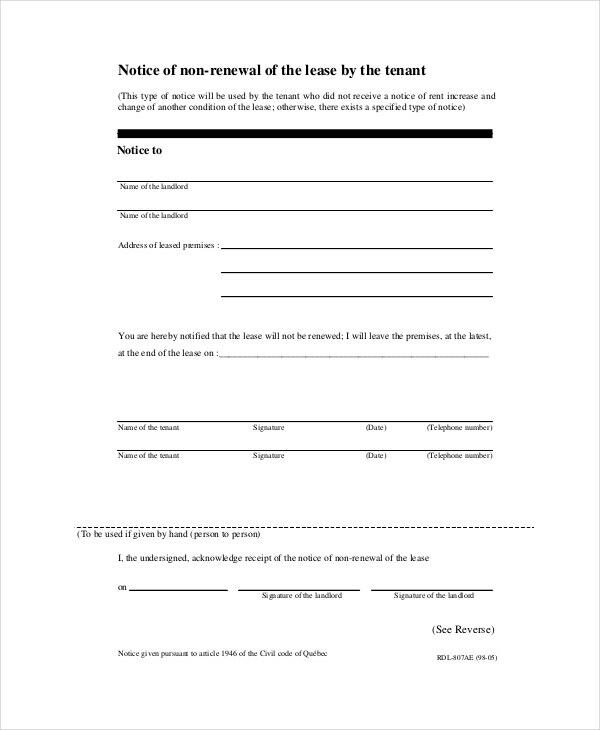 This is the template of a notice given by the tenant to the property owner when he decides not to renew the lease any further. The situation could arise when the tenant might not have received any notice served by the property owner for increasing the rent or a change in the original agreement. > What is the Purpose of the Agreement? The letting out of an apartment is a contract. It is mandatory as per the law to document the transaction in order to avoid any disputes at a later stage. This would be beneficial to both the property owner as well as the tenants. The document should be clear and crisp detailing out the terms and conditions of the agreement. It should also include the rights and obligations of both the parties in question. Having a properly documented format executed at the commencement of the lease is beneficial. Once the parties have executed the agreement, they would not be in a position to dispute the terms and conditions. You may also see Residential Lease Templates. > Who is the Target Audience? Obviously, there are two parties to such apartment lease agreements. One is the property owner whereas the tenant completes the other part. It may happen on occasions that there could be the involvement of an agent from either side. In such a scenario, the agent should also be a party to the agreement. You may also see Rental Lease Templates. The agreements clearly spell out the rights and obligations of both the parties. The documents contain details of the facilities that are on offer. The agreement or contract as the case may be should also be very clear about the termination procedures. It is mandatory on the part of both the parties to serve notices, in case they require a change in the original terms. > What are the Benefits of the Agreement? 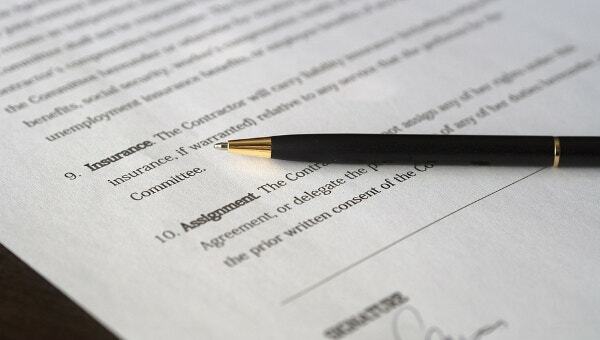 Taking or Commercial Lease Templates out an apartment is a contract. It is mandatory to document the contract. Otherwise, there may be disputes later on about the amount of rent and other terms and conditions. This document would clearly spell out the terms of the lease. This would include the period of the lease, the amount of rent and security deposit payable, as well as the facilities that are on offer. On signing the agreement, the consenting parties would have a legal binding and hence, would not be able to dispute the same at a later stage. In some states, you may have to register the document as well. We have discussed some apartment lease templates with the Internal Link Anchor text. Both the parties should execute these mandatory documents prior to occupying the house or apartment on rent. The parties to the agreement would not be in a position to disown their liabilities or dispute the same on having agreed to it in the first place.